Sign up here and you’ll stay up-to-date on new content. Hey there! My name is Ariel and I’ve lived with type 1 diabetes for 12 years. 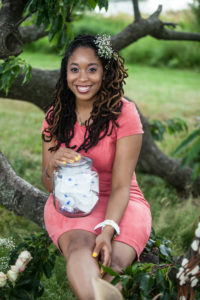 Just a Little Suga’ is a personal blog with an expansive focus, seeking to shed light on the experiences of individuals of color and marginalized communities affected by diabetes. Thank you for joining me on this journey. A personal blog by a type 1 diabetic. An inclusive space shedding light on the experiences of a diabetic on the margin. Just A Little Suga’ is an inclusive space seeking to shed light on the experiences of diabetics on the margin, individuals of color affected by diabetes. These are our musings on life with diabetes influenced by race, culture and family. That alone makes them valid. © Ariel Lawrence and Just a Little Suga', 2019. Unauthorized use and/or duplication of this material without express and written permission from this site’s author and/or owner is strictly prohibited. Excerpts and links may be used, provided that full and clear credit is given to Ariel Lawrence and Just a Little Suga' with appropriate and specific direction to the original content.